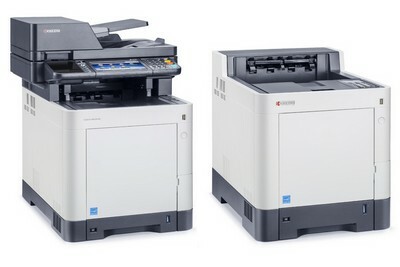 Faced with the growing demand for fast A4 printing equipment, Kyocera has announced the release of seven new A4 color machines: four multifunctions (M6030cdn, M6530cdn, M6035cidn, M6530cidn) and three printers (P6130cdn, P6035cdn and P7040cdn). In addition to advanced features such as support for mobile printing from iOS and Android, the new series are fast - up to 40 pages per minute for P7040cdn printer. The ECOSYS printers have P7040cdn P6035cdn and multifunction as 30 ppm (M6030cdn and M6530cdn) of a 5-line LCD screen with a physical keypad. This is very useful for entering PIN codes for job release. They also support a user access control system which can restrict access to functions according to the source application, for example to prohibit the printing of emails in color. The 35 ppm multifunctions ppm (the Ecosys M6035cidn and the version with fax, the Ecosys M6535cidn) offer quite remarkable scanning speeds for A4 devices: up to 60 ipm. They are also equipped with a large color touch screens allowing the integration of software solutions compatible with the HyPASS extension platform. These seven new devices are already available, with the exception of the ECOSYS printer P7040cdn which goes on sale in a few months time.